An innovative collaboration between an Ohio county child protection agency, a local science center and a private donor is helping parents separated from their children due to abuse and neglect improve their chances of successfully reunifying their families. The partnership between Lucas County Children Services (LCCS), the nonprofit science center Imagination Station and Lockrey Manufacturing, all of Toledo, Ohio, is helping parents who have lost custody of their children regain important parenting skills so they can live together safely. LCCS was looking for ways to help parents improve the quality of their weekly visits at the agency with their children. Children living away from their parents, due to abuse or neglect, visit with their parents at LCCS under varying levels of supervision by agency staff. Many parents struggle to interact with their children during these visits, watching the children play on the floor rather than engaging with them. In a 1998 journal article in Child Welfare, Loar noted that, “visits between parents and children are key to successful reunification. Providing a safe and possibly supervised setting, however, is not always sufficient to facilitate positive parent-child interaction. 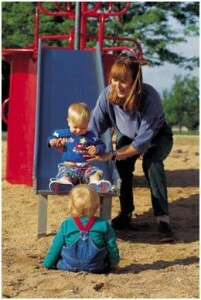 Parents often have to learn how to play with and enjoy their child’s company.” Similarly, McWey and Mullis in a 2004 Family Relations articled titled “Improving the Lives of Children in Foster Care: The Impact of Supervised Visitation,” emphasized the importance of this kind of quality visitation to maintain parent-child attachment during involvement with child welfare systems. Lockrey Manufacturing provided the funding needed to allow Imagination Station workshop leaders to bring interactive programs and activities to the LCCS Family Visits department. The science-themed activities encouraged parents and children to collaborate and build small catapults or rubber band cars, launch tiny rockets and other fun projects. Parents were required to be in the room and engaged with their children during the activity. The workshops were scheduled during peak visiting times (afternoons) on varying days of the week. Each workshop lasted about two hours, with parents and children coming and going based on their scheduled visit times. More than half of parents surveyed felt that having Imagination Station at LCCS made them somewhat or much more likely to participate in visits with their children. LCCS staff observed families actively participating in the Imagination Station projects during their visits. The parents told staff how much they enjoyed having this structured activity to do with their children. After about a year of success, the project partners added a second phase to support families who were on the path to reunification: supervised visits to the science center for individual families. For most parents involved in the child welfare system, their goal is to regain the right to parent their children once the risk in the family home has been eliminated. Parents who have followed their case plans and improved their parenting skills to a safe level gradually earn permission to visit with their children away from the agency with a supervising third party (such as a relative, foster parent or caseworker). If these visits are successful, the parents step up to having unsupervised visits with their children and, if all goes well, are reunified. Located four blocks from LCCS’ downtown Toledo offices, Imagination Station offered the ideal location for parents and children to rebuild their relationships. Research conducted by Haight, Leathers and Haight, Kagle & Black have advocated that visits, “should allow for replication of normal care-giving activities.” A trip to the science center provided that normal activity for children and parents. Through the partnership, Imagination Station provided families with deeply discounted tickets and caseworkers with free passes to supervise families on their caseload. The discounted family tickets cost parents only $1 per person for a day pass to the science center. “The donor felt it was important for the families to have some, ‘skin in the game,’ by paying something toward their admission fee, but not an amount that would prevent them from taking advantage of the opportunity,” explained Karen George, corporate development officer for Imagination Station. “Anytime you can bring together government agencies like LCCS, private companies like Lockrey Manufacturing and community assets such as Imagination Station to strengthen families, it’s a win-win for the entire community,” says Dean Sparks, LCCS Executive Director. In the future, the partners hope to provide reunifying families with opportunities to earn memberships to Imagination Station. For now, simply offering families an opportunity to rebuild relationships torn apart by abuse or neglect is a significant achievement and an ideal example of a government agency, nonprofit organization and private donor working together to improve their community.